A layout is a data structured arrangement which describes how the MaxAim DI engine should map the keyboard, mouse buttons and Direct Input entries to the controller's buttons and how the mouse movements should be translated to the controller's analog stick. A layout can also contain the bytecode of a GPC script for advanced customization, one button press macros, automation of commands, event reaction and more. 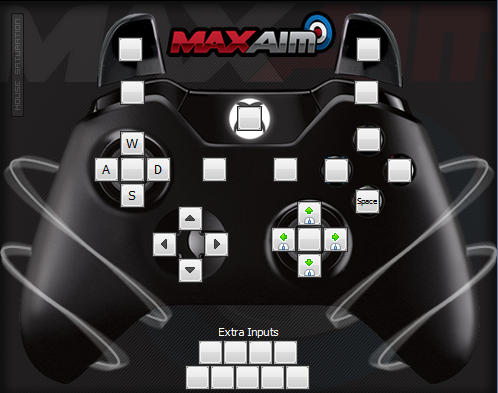 MaxAim DI supports multiple layouts for multiple games settings, as every game needs a different buttons mapping and they all have different stick dead-zones, geometries, variable sensitivity, acceleration regions, asymmetric sensitivity and non-linear movement. 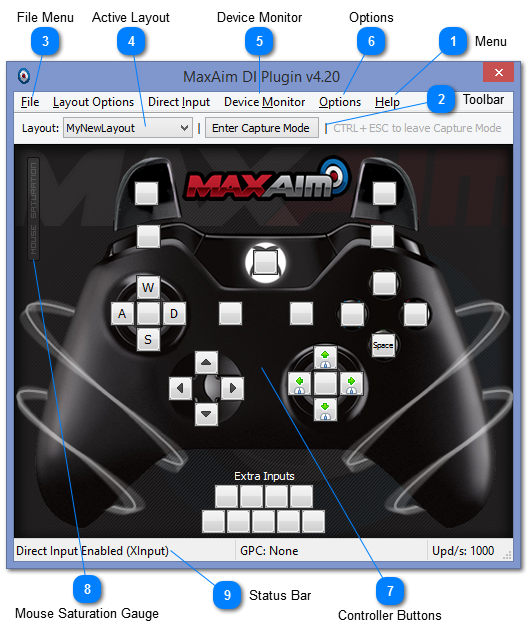 The menu bar has a set of drop down menus for easy access of all MaxAim DI functions, such as creating and exporting layouts, configuring mouse settings, Direct Input settings, accessing Gtuner plugin integration tools, displaying help documentation, interacting with application and so on. • File Menu: The File menu contains a set of operations for layout management. • Layout Options: Menu with a set of tools and operations for configuration of active layout. • Direct Input: Enable/Disable Direct Input and game controller settings for Direct Input. • Device Monitor: Gives access to Gtuner's Device Monitor, this menu is available only in plugin mode. • Help Menu: On the help menu you have links to our website, to the MaxAim DI online forum and to access this documentation. The About item open a dialog window that shows you information about the MaxAim, copyright and author's credits. The first control in the toolbar is a combo box which lists all available layouts, the active layout can be changed depending on the game you are playing. The "Enter Capture Mode" button will trap your keyboard and mouse inputs, so you can gaming without interfering with the computer's UI/OS. The message on leftmost side will be highlighted when in capture mode, it is a hint for how to stop the capture mode. • New Empty Layout: Create a brand new empty layout, with default mouse settings. This operation can also be performed through keyboard shortcut (Ctrl+N). A dialog box will popup to enter the layout name. • New FPS Layout: Create a basic FPS layout, with some buttons mapped (movement, aiming, jump button, d-pads) and with default mouse settings. A dialog box will popup to enter the layout name. • Delete Layout: Delete the current active layout. A warning message will be shown to confirm the deletion. This operation cannot be reversed once it has been done. • Export Layout: Layout exporting enables you to share layouts with your friends and to have a backup copy. The exporting combined with import operation can be used to clone a layout, this may help on the creation of a new game layout, since the basic configurations is already done. • Import Layout: Import a MaxAim layout file. The imported layout may need be renamed if the original name is being used by another layout. • Exit: Close the MaxAim DI. The layout combo box contains all available layouts, select the layout you want configure or for the game your are currently playing. The active layout is also used on export and delete operations. Gives access to Gtuner's Device Monitor, this menu is available only in plugin mode. • Open: Interacts with Gtuner to open the Device Monitor window. • Close: Close the Device Monitor window, if it is opened. Toggle between Esc or Ctrl+Esc as the shortcut key to leave Capture Mode. The buttons, overlapping the controller image, besides of showing the mapping assignments, can also be used to operate the console by clicking on they as if you were pressing the controller buttons. You can actually see this feature in action by opening the Device Monitor and checking the output fields while clicking on the MaxAim buttons. In Capture Mode this gauge will fill green as you move the mouse, representing the current mouse speed. This visual indicator goes red when the mouse speed is saturated, meaning moving the mouse even faster will have no effect in game. The Status Bar is an information area of MaxAim DI, found at the bottom of the main window. The status bar is divided into sections, each of which shows different information. The very first section displays information about the Direct Input and the capture mode. The second section, in the middle, shows information about the loaded GPC script, in the example picture there is no GPC script loaded (None). The last section displays the updating rate, in other words, how many times per second a data report is sent to the console. The higher this value the better. MaxAim DI don't impose any limit besides the maximum 1000 reports per second of USB architecture. The updating rate only depends of your computer performance.